For work reasons I found myself in Tamarindo for the first time, on a three week visit. My first impression was of a modern city which contrasted with the fourth world streets, nonexistent sidewalks, no sanitary treatment and no plan regulador. But within this world of contrasts I discovered a babel of gastronomy such as I have seen in great cities such as New York, Paris or Madrid, the difference being that within a short distance one can find: eggs benedict for lunch with a mimosa at Kahiki; good shakshuka and shawarmas at Falafel del Mundo; the best pasta at Nibbana; excellent pizza at La Baula; great gourmet cuisine at Coconut; delicious ice cream at Buon Apetito; the best pad thai I have ever tasted at Wok & Roll; exquisite cous cous at seasons and a memorable dragon roll at Koi, a never-ending list of dinning delights, and you will find even more interesting places, sometimes hidden at first glance. At last for national tourist and foreign visitors who love good cooking, one can make a multicultural gastronomic tour, so different San José in that there we have to travel long distances and fight interminable traffic to get from one place to another. In Tamarindo, all these delights are within shorts distances, without traffic and in a secure environment. Extract from “The Howler”, August 2010 issue. Written by: Lic. José Gerardo Martínez. The sun came out this morning and I took some pictures from Casa Banyan, especially to feature the beautiful huge tree. It was nice to see a family of howler moneys feeding from the leafs. 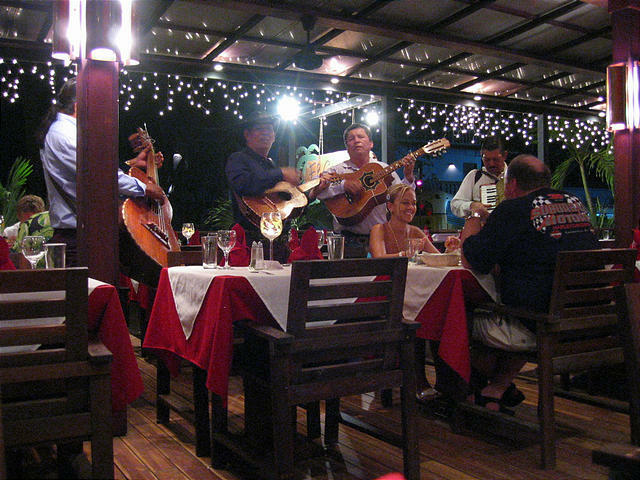 Here is more about Casa Banyan located in Tamarindo on the beach.